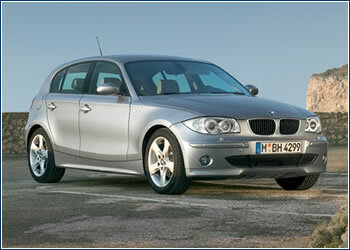 BMW doesn’t intend to go along with the pack, so even the new Series 1 – a compact, five-door hatchback – stays with the classic rear-wheel-drive concept. It’s truly unique among myriad front-wheel-drive competitors. THE CREATORS of this 4.23 meter-long car have managed to offer a pure-blooded BMW even in compact form, providing the joy of sports-car driving along with active and passive safety. The lift-up hatch in back and variable luggage space (330 to 1,150 liters) allow for practical use. The 2.66 meter wheelbase (the longest in its class), ideal division of weight (50:50) on the front and rear axles, a new, five-element rear-wheel suspension, precise steering, and an extremely effective braking system – these are all virtues of the new BMW. All models are equipped with ABS, DSC and DTC (Dynamic Stability Control and Dynamic Traction Control) chassis systems, two-level brake lights showing braking intensity, and Runflat technology tires that allow up to 150 kilometers of driving at reasonable speeds with a flat. 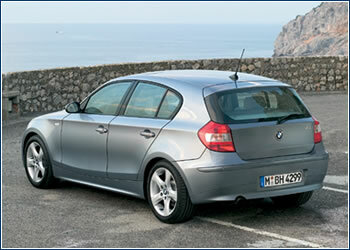 The line includes the BMW 116i model, with a 1.6 l, 115 hp (85 kW) gasoline engine and a five-speed transmission (CZK 615,000), and the BMW 120i, four-cylinder, 2.0 l, 150 hp (110 kW) gasoline engine and a six-speed transmission (CZK 740,000). Two Common Rail technology turbodiesels offer fast, economical performance: the BMW 118d turns out 122 hp (90 kW), and the BMW 120d unleashes 163 hp (120 kW) and noteworthy torque of 340 Nm at 2,000 rpm. Both come with six-speed transmissions (CZK 680,000 for the former and CZK 755,000 for the latter). Importers also offer valuable reduced-price packages called Advantage (automatic AC, radio with CD player), Dynamic (lower sports chassis, sports seats and steering wheel), and Comfort (automatic temperature control, assisted parking), as well as a Dynamic + Comfort version.